Of all the documents making their way into your TMF, the informed consent form is the most important. Although you probably already knew this fact, do you know how it came to be this way? Why do auditors and inspectors review 100% of the informed consent documents, and typically do so before reviewing anything else? In 1880, Giuseppe Sanarelli, an Italian bacteriologist, was working for a special U. S. Army commission, the Yellow Fever Board, led by Army Major Walter Reed. American forces had occupied Cuba after the Spanish American War, and thousands of troops had died of tropical diseases (while only 300 had died as a result of combat!). Most people of that time thought yellow fever was transmitted by ‘fomites’ (the close personal items of those who had contracted the disease, like clothing or bedding). However, some scientists, including Giuseppe, suspected insects could be the source—but they were frustrated because they could not prove it. In his frustration, Giuseppe intentionally infected five volunteers. Fortunately for Giuseppe, he proved that yellow fever was indeed transmitted by the mosquito—a career-defining achievement—but unfortunately for him, after the death of one of the volunteers, Major Reed returned to Cuba and was shocked at what he observed. Major Reed encountered sloppy experimental conduct and the realization that desperation—not bravery and honor—had compelled the “volunteers” to participate. In response, Major Reed piloted the development of ethical guidelines for his Yellow Fever Board. The most important of these was the deployment of an informed consent document letting the patient know that they didn’t have to participate. This was a major shift from the typical government and military research of the day that often pressured inmates or other “low men on the totem pole” to participate. Although a great first step, Major Reed’s document still wasn’t really a process for ensuring consent, and didn’t provide the tools necessary to ensure a third party could understand the story of a subject’s participation. As World War II drew to a close and the Allies marched into Germany, they were greatly disturbed by what they saw and they were determined to do something about it. In 1945 and 1946, they held the Nuremberg trials to seek justice for the victims of Nazi physicians who conducted unethical, grotesque experiments on the “patients” in their care. From the lessons learned during the military trials, the Nuremberg Code for Experimentation on Human Subjects was enacted in 1947. The Code and its ten subject-centered principles were based on the ideas of beneficence (acting with the patient’s welfare as the ultimate goal) and non-malfeasance (do no harm). The Code also outlined the legal doctrine of informed consent and attempted to clearly (although somewhat unsuccessfully) set up boundaries between therapeutic and non-therapeutic research. Although its basic principles are the blueprints of modern informed consent, the Code was focused more on punishing the Nazi doctors and preventing the next “Nazis” than on addressing the circumstances you might find in your average research office. The 1964 Declaration of Helsinki, developed by the World Medical Association, sought to correct the Nuremberg Code’s lack of practical details. The Declaration announced in the British Medical Journal as non-binding guidance under international law, tried to further clarify the differences between medicine and medical research. The closeness of medical practice and medical research had, even after the development of the Nuremberg Code, allowed doctors to abuse the trust of their patients. As a foundation, the Declaration confirmed voluntary consent was “absolutely necessary”, but also focused on problems that came with modern drug and device research, like how to proceed when faced with those too sick or too young to give their own consent. Finally, informed consent was becoming a process rather than just a sign-and-forget document. The publishing of the Declaration of Helsinki, however, still did not solve underlying societal problems that almost always played a big role in the worst abuses of subject rights. The same year the Declaration of Helsinki was adopted, the passage of the Civil Rights Act in 1964 shed an unflattering light on how certain populations in the United States were still being systematically denied true informed consent. Clearly, certain people in society didn’t have the power to stand up to hospitals or government agencies. There is no greater illustration of this one-sided situation than the Tuskegee Syphilis Study. In this infamous study, investigators observed the progression of untreated syphilis in Africa-America men in rural Alabama. Patients, many of whom never actually gave proper consent, were told they were receiving free government healthcare, but were simply being watched to learn more about what untreated syphilis looked like. The study, which had begun in 1932, lasted 40 years. Over those 40 years, syphilis was practically cured but the study protocol did not change at all—even after penicillin was widely available. Investigators lied or avoided telling the men why they were getting their symptoms, and most were too disadvantaged to get a second opinion. The men were never even told they had a disease. After a whistleblower attracted public attention, the National Research Act was passed in 1973. From the Act, principles of informed consent became codified in federal regulation. The Act ensured that all human-subject research protocols be reviewed by an Institutional Review Board. The Tuskegee Study is also the main reason why patients must be re-consented when the situation changes, such as when the protocol is amended or when alternative treatments become available. Of the regulations stemming from the National Research Act, the Belmont Report of 1979 gave even more detail about how a trial should be run to maintain real consent. The report was published in the Federal Register by the Department of Health, Education and Welfare, and is the true regulatory foundation for today’s informed consent. Like the pivotal documents before it, the Report identifies ethical principles: respect for persons (protections of autonomy), beneficence (do no harm), and justice (fair distribution of the risks and rewards of research)—and it also gives investigators an idea of what a good trial looks like. In addition, the Belmont Report provides the government with the tools to proactively create regulation instead of acting only after a whistleblower comes forward. The Belmont Report more fully examines what makes a patient ‘vulnerable’, and the extra protections these subjects need to make sure their consent is actually valid. But how do these historical events shape the modern TMF? In every single way! 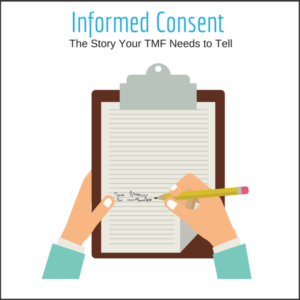 The informed consent process and the foundational purpose of the TMF are completely intertwined. The TMF structures and stores documents in a way “essential for the reconstruction of the conduct of any clinical trial during an audit or inspection process.” This is a more elegant way of saying “If it is not documented, it did not happen.” The informed consent form assures everyone that the study’s patients wanted to participate, and understood what they stood to receive and what they were giving away for the benefit of others. Built upon a fascinating and important history, the informed consent is meant to tell us that the trial’s conduct revolved completely around the wellbeing of the subject (beneficence), and that it upheld and protected the subject’s personhood (justice and autonomy). It is proof that your trial has learned from the past and is filled with the spirit of hard-won ethical principles.